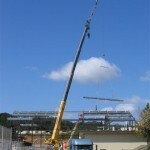 Redwood & Silverado Middle School - Swank Construction Inc.Swank Construction Inc.
17,000 square foot onsite improvement. Includes: grading, utilities, asphalt paving with concrete walks and construction of a new Type V‐1, one story Gymnasium and classrooms. The gymnasiums have maple wood floors, 6 retractable basketball hoops and associated volleyball standards. The classrooms have acoustical ceilings, hollow metal doors, frames and hardware aluminum windows and VCT floorcovering.